If you run out of Flex $ and Gold $, you can stop by Blum Union, Room 102 to deposit money into your gold account. We accept cash, personal checks (made out to Missouri Western State University), Discover, Visa and Mastercard. The deposit cannot be added to your student account in the Business Office. 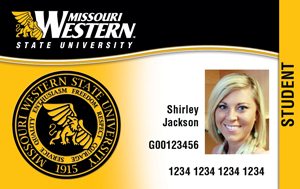 Make Your Griffon Card the only Card on and off Campus! You have enough to worry about in college without having to stress out about your finances. U.S. Bank makes it simple. Open a U.S. Bank checking account and turn your Griffon Card into your Campus ID and ATM/Debit Card — all in one. We’ve made it easy for you to manage your money with the best checking account for students in the country. Learn more about U.S. Bank! Start using your Griffon Card as your ATM and PIN-based debit card today! Simply sign up for a U.S. Bank checking account at any branch, call us at 800-US BANKS (872-2657) or apply online at usbank.com/western. For your convenience, U.S. Bank has an ATM in the Blum Union and has five branch offices in St. Joseph, MO including two that are in close proximity to the Missouri Western campus. If your Griffon Card has been lost or stolen, report it to the University Police Department immediately. If your Griffon Card has been activated to act as your U.S. Bank ATM and PIN-based debit card, notify U.S. Bank immediately at 800-US-BANKS (872-2657). Lost or stolen Griffon Cards will result in a $10 replacement charge. The $10 replacement charge is imposed by MWSU not US Bank. Please leave information about any suspicious activity with this anonymous hotline.